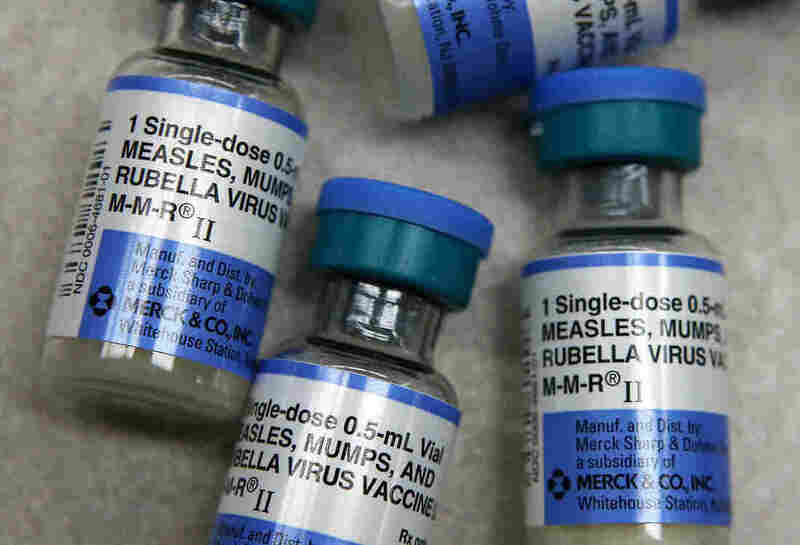 Somali Community's Autism Fears Fuel Measles Outbreak : Shots - Health News A measles outbreak in Minnesota's Somali-American community is the latest example of the challenges public health officials face in addressing deeply ingrained concerns about vaccine safety. Vials of measles, mumps and rubella vaccine are displayed on a counter at a Walgreens Pharmacy in 2015 in Mill Valley, California. All four of Anab Gulaid's children have received their vaccinations on the recommended schedule. As Somali-American residents of Minneapolis, that puts them in the minority. Fewer than half of Minnesota children of Somali descent have received the MMR shot that protects against measles, mumps and rubella, according to the Minnesota Department of Public Health, which is now working to combat a growing measles outbreak in the Twin Cities. As of Wednesday, the case count was up to 34 — all but two unvaccinated, almost all Somali-American, and mostly children ages 5 and under. Even in the midst of the outbreak, Somali resistance to vaccination remains strong in Minneapolis. Minnesota is home to the largest Somali population in the United States. It's a relatively recent attitude that emerged alongside escalating fears about links between MMR and autism among the immigrant group. Understanding the history behind those fears — and the culture that reinforces them, contrary to abundant scientific evidence — is an important step toward overcoming them, research suggests, and not just in Minnesota. "There is a context; this didn't just come out of nowhere," says Gulaid, who studies autism as a public health researcher at the University of Minnesota's Institute on Community Integration in Minneapolis. Her own children range in age from 8 to 17. "In my public health opinion, you can have a message, but if you come across as not listening, you can also lose that message." Vaccine resistance has been an issue since the technology was widely introduced in the early 1800s, says Eve Dubé, a medical anthropologist and public health researcher at Laval University in Quebec City. Since then, people have cited concerns about vaccine safety, sterilization conspiracies, and government control over their bodies and rights. Today, Dubé estimates, about one third of North American parents are hesitant to get their children vaccinated. Some but not all of those end up delaying or refusing shots. Reasons for that wariness vary, and concerns often cluster within regional subcultures, and not just among immigrants. In France, for example, worries persist about an unsubstantiated link between the Hepatitis B vaccine and multiple sclerosis. Various religious groups oppose vaccines, as do certain groups who favor organic and natural lifestyles. In developed countries, some experts argue, support for vaccines has also declined alongside a fading memory of the diseases they were created to prevent. And while multiple studies have shown spikes in vaccine-preventable diseases (including pertussis, polio, mumps and measles) in schools and regions around the world with low vaccination rates, such as affluent neighborhoods in Northern California and an Amish community in Ohio, it is extremely challenging to change people's opinions about vaccines, Dubé says. Attitudes are often deeply ingrained. She once interviewed a mother whose baby was in the hospital, extremely sick with pertussis, but the mom still believed that not vaccinating was the right choice. Dubé has also interviewed people who had bad reactions to vaccines but have no regrets. And even when vaccination campaigns win over people in one place, the same strategy can fail elsewhere. "It's like there's a predisposition to be mistrusting of these types of interventions," she says. "There's not much strong evidence in the literature or magic bullet ideas that can solve this issue." Complexities are widespread among the Somali community in Minneapolis, where concerns about autism emerged around 2008, after Somali parents expressed concerns about disproportionately high numbers of Somali preschoolers in special education classes who were receiving services for autism spectrum disorder, according to the Minnesota Department of Health. Parents had lots of questions, particularly about what was causing the disorder, says Asli Ashkir, a senior RN consultant with the Minnesota Department of Health in St. Paul. "We don't have a word in our language that translates to autism," Ashkir says. "So when this started, we were like, 'What is this?' "
Around the same time, Andrew Wakefield, a British scientist who used fraudulent research to argue that the MMR vaccine causes autism, visited Minneapolis. He also teamed up with vaccine-skeptical groups to raise concerns about the shots, Ashkir says, fueling fear within an immigrant community that was already up against language barriers in a country that was new to them. Concerns quickly influenced behavior. In 2004, according to the Minnesota Department of Health, 92 percent of Somali-Minnesotan children were vaccinated with MMR. After 2008, Ashkir says, rates of vaccination with the so-called "triple-letter vaccine" dropped by 5 to 7 percent each year. As of 2013, just 45 percent of Somali-American children in Minnesota had been vaccinated. "We communicate orally," Ashkir says. "The words fly." Alleviating those concerns happens more slowly, she says. In collaboration with the Minnesota Department of Health, she is using a variety of strategies to educate the local Somali community about both vaccines and autism, including advocacy for early intervention therapies for children with autism. She is also working with health clinics to give patients more time with doctors so they can get their questions answered with help from an interpreter. "When a Somali person sees that a doctor is in a hurry, they don't want to ask questions anymore," she says. "In a clinic visit with three people, 15 minutes is not enough." Eventually, Ashkir would like to involve influential community members and religious leaders in public health efforts. It's a strategy that has worked elsewhere, including a region in Western Australia where vaccine coverage was among the lowest in the country, in part because of a locally popular alternative lifestyle that valued home births, breastfeeding, cloth diapers and not vaccinating. In 2014, a campaign there called "I Immunise" enlisted help from six locals who were featured on posters, billboards, signs and online about how vaccination fit into their alternative lifestyles. Among about 300 people who were surveyed about the campaign, researchers reported in 2015, more than 75 percent said it made them think more positively about vaccination. Still, nearly 70 percent people who had refused vaccines in the past gave negative reviews, illustrating how polarizing the issue remains. Ultimately, researchers say, compassion may be one of the most powerful tools for spreading public health messages in hesitant communities. It's not fair to characterize people who question vaccines as "selfish or dumb," says Dubé, who has studied MMR resistance among Somali immigrants in Sweden, among other groups. "These are well informed people that want to do what's best for their families, with questions and concerns that have not been resolved." "The idea is to listen to the community's specific concerns," she adds. "It's something that seems obvious but that public health is really bad at doing." Empathy can go a long way, Gulaid agrees. Her 8-year-old twin daughters were born around the time that fears of autism emerged among Somali-Americans in Minneapolis. And while she decided to move ahead with the recommended vaccination schedule, many of her friends have delayed their children's shots. She doesn't fault them for it. "The Somali community is resilient and strong, and they've gone through a lot of hardships," she says. "They just want healthy children. I understand their concerns."